"How easy it is for man to believe that temporal success has been achieved by his own skills and labor. Everything good comes from the Lord. 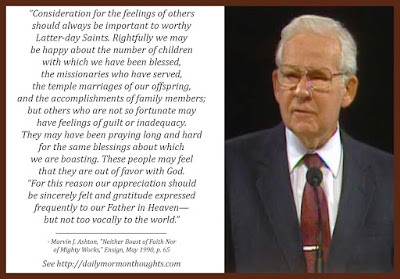 "Consideration for the feelings of others should always be important to worthy Latter-day Saints. Rightfully we may be happy about the number of children with which we have been blessed, the missionaries who have served, the temple marriages of our offspring, and the accomplishments of family members; but others who are not so fortunate may have feelings of guilt or inadequacy. They may have been praying long and hard for the same blessings about which we are boasting. These people may feel that they are out of favor with God. "For this reason our appreciation should be sincerely felt and gratitude expressed frequently to our Father in Heaven—but not too vocally to the world. "May we all be gratefully aware of the source of our blessings and strengths and refrain from taking undue credit for personal accomplishments. "Oftentimes when we dwell on where we have been and where we are now, and what we have now spiritually or financially, we can create resentment rather than respect. "Boasting, whether it be done innocently or otherwise, is not good. Too frequently it creates an impression of more interest in self than in others." 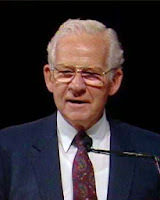 Many years ago, not long before this conference talk was given, I attended a stake conference in Colorado at which Elder Ashton presided. One of the speakers in the meeting was a woman who was obviously very proud of her accomplished husband and her large family, and their many wonderful achievements; she spoke at some length about the joy of her family's successes. When it was Elder Ashton's turn to speak, he gave a gentle but firm rebuke in much the same spirit of this quote—his decision to speak on this topic in conference was likely a result of this experience, and others like it. In our stake, he pointed out that as fortunate and blessed as the sister was, there were others in the room who, through no fault of their own and no lack of worthiness and effort, didn't have the same blessings; and did she recognize how truly fortunate and blessed she was, far beyond anything she had done to earn or merit the blessings? He went on to reassure all present that God loved them equally as much, and would bless them appropriately (in His own time and way) for their faithfulness. 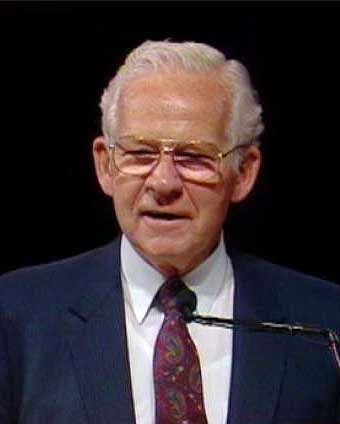 Elder Ashton was a master teacher, and presented that message in a way that was not in any way hurtful or critical, but only offering loving counsel to all of us that we should be much more aware of those around us and sensitive to their feelings. I am one who has occasionally felt "feelings of guilt or inadequacy" when some of these kinds of things have been expressed, wondering why I was not deserving of the blessings that someone else was receiving. And I have likely been one who has made others uncomfortable as I have unwittingly expressed gratitude that came across as boasting. This is the tender suggestion from Elder Ashton: "our appreciation should be sincerely felt and gratitude expressed frequently to our Father in Heaven—but not too vocally to the world." And this results naturally from remembering that God is the source of our blessings, and we should never take "undue credit for personal accomplishments."